Little Data, typically, is found within a credit unions operational systems. Systems that are highly structured and require proper inputs to make them function properly. These types of systems include, but are not limited to, Loan Origination Systems, Core Systems, Credit Card Processing Systems, etc. These systems collect member and account information in a conformed fashion and, even more importantly, the transactions that are generated. These transactions represent the behavior of a member. It is fairly easy, with the right tools, to find specific member and the account-related (transactions) information that member has done with the credit union in a structured data source and thereby track behavior. Big Data is found in unstructured data sources that generate far more data points (behaviors) than the structured data sources. A few examples of unstructured data sources are social media (Facebook, LinkedIn, Twitter, etc. ), CRM, ratings/comments, etc. These sources are very difficult to analyze manually on a case by case basis. The sheer amount of data generated by these sources often causes this data to be underutilized or completely not used at all. This data, however, is just as valuable, if not more valuable, than the structured data from the Little Data sources. Mining value out of Little Data and Big Data is equally important but just as challenging and complex in both. Little Data (Structured Data) can be mined with common business intelligence tools and languages such as Structured Query Language (SQL). In order to maximize the value of the data, however, the structured data sources must be fully integrated and normalized. The integration is achieved by establishing data infrastructure, commonly implemented via a data warehouse or data model. Integration using a data warehouse can allow a credit union to get a complete 360 view of their members by linking transaction data across all subject areas. Data integration also creates a “a single source of truth” so a credit union can “know” everything about their members through their behaviors (transactions). Big Data (Unstructured Data) can be mined with more advanced “Big Data” tools such as Hadoop, Cloudera, and MongoDB. These tools are not for the data beginner but are necessary for the evolution from Little Data to Big Data. For example, Big Data tools can allow credit unions to make sense out of data that is not easily done manually. These tools allow a credit union to comb through tens of thousands of comments, ratings, and likes in seconds and finding relationships that would otherwise be overlooked. Insight derived in this way in areas such as member sentiment can often more valuable than data collected in a structured form such as a loan application. In the world of data and data analytics, credit unions must leverage ALL the data accessible to them. Credit unions should start with the structured data within their own operational systems by developing the data infrastructure to manage, store, and analyze the data. Once the credit union has all of their structured data in a single repository, planning should begin to leverage unstructured data from available data sources. Determining the right tools will be critical. It is very important that Little Data tools (SQL Database / Data Warehouse) are connected to, or compatible with, the Big Data tools (Hadoop, Cloudera, and MongoDB). If the data warehouse does not support the move from structured data to unstructured data there will be a serious loss of value. While both Big Data and Little Data are extremely powerful, the marriage of the two is where the real value lies. 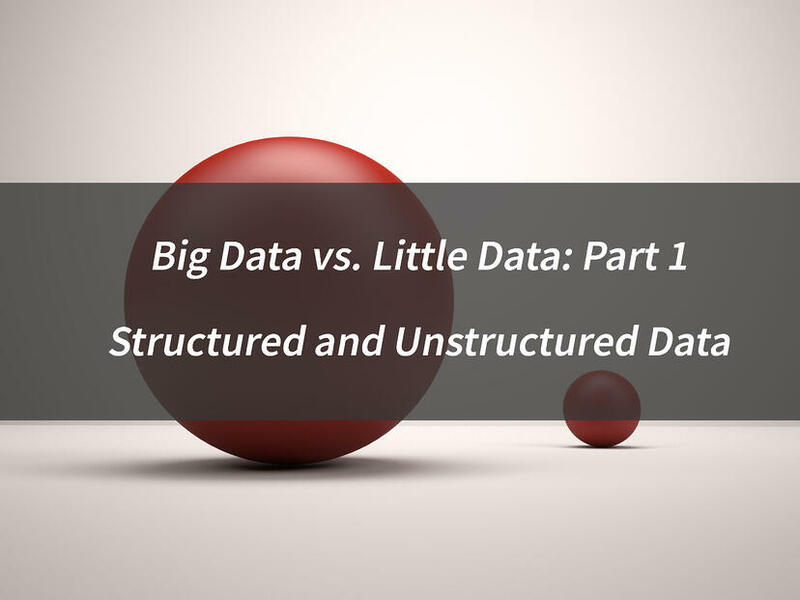 Big Data vs. Little Data: Structured and Unstructured Data is Part 1 of a blog series on Big Data vs Little Data, the tools used and the value the can be found in the various sources. Subscribe to our blog to learn more and stay up-to-date on the latest in data analytics for credit unions.